: The Holiday, Knocked Up, The Kingdom, Serenity, American Gangster, Mr. Bean’s Holiday, An American Werewolf in London and Dante’s Peak. Each movie cost £5.99, shipping is free for Europe add £4 for the rest of the world. I’ve got 2 to 4 copies of each movie. I’ve also got some PSP UMD for sale: DodgeBall, Austin Powers: Goldmember, Daredevil, Chain Reaction, Behind Enemy Lines, Alien vs. Predator, Kingdom Of Heaven og Predator. It’s £4.99 each. I’ve only ship the UMD movies to Europe since they are region 2 and will only play in a European PSP. Free shipping. I’ve have some HD DVD movies and Sony PSP UMD (region 2/Europe) movies for sale on eBay.co.uk . Free shipping to Europe, add £4.00 for rest of the world. Since UMD movies as region 2, these will only be shippet to European countries. I’m selling 8 HD DVDs on eBay.com.au. They are new and still factory sealed, I ship worldwide. The titles I have for sale are: American Gangsters, An American Werewolf In London, Dante’s Peak, Knocked Up, Mr. Bean’s Holiday, Serenity, The Holiday and The Kingdom. [UPDATE] This auction have now ended.
. I sell them in packs of two with free Worldwide shipping. I have Knocked Up and The Holiday, Dante’s Peak and An American Werewolf in London, Mr. Bean’s Holiday and Serenity, and The Kingdom and American Gangsters. 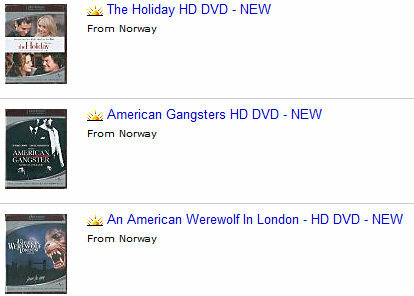 I’ve added 8 HD DVDs for sale on eBay. I ship worldwide. The HD DVD movies for sale are: The Holiday, American Gangsters, An American Werewolf In London, Dante’s Peak, Knocked Up, Mr. Bean’s Holiday, Serenity, The Kingdom. The movies where added on eBay Australia – eBay.com.au. UPDATE: The auction has ended long time ago. 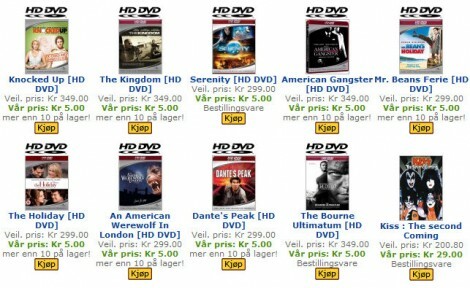 The Norwegian webshop PlayX.no have 9 HD DVDs on sale priced at only 5 NOK (Norwegian Krones). That’s equal to around £0.48, €0.55 or US$0.72. Better deal than that is hard to get. I don’t know if PlayX.no ship abroad. Need some cheap HD DVD movies? Is there some HD DVD movies you have missed out? I have a lot of HD DVDs, and Amazon.com now have a lot of HD DVD movies at around US$10. So if there is some you still don’t have, know you can grab them at a good price.